“Can you recommend a good routine for building muscle after 50,” asks MK via email. 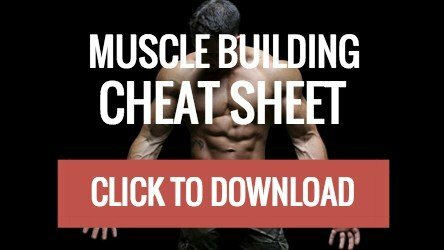 Is It Possible to Build Muscle After 50? Of course it is. The human body can and will adapt to the stress you impose on it, even in your 40’s, 50’s and beyond. But, there are limits. Your body won’t respond in the same way that it did in your younger days. My first suggestion would be to stop trying to compete with your former self. It doesn’t matter what you did when you were 21, 34, 42 or whenever. Things are different now, and you have to take that into account when deciding what to do in the gym. You may have started out wanting a physique like Arnold in his younger days. A couple of decades later, you may still want a physique like Arnold in his younger days. But if you’re currently walking around with a large gut, knackered shoulders and a dodgy knee, it’s probably not going to happen. Setting ambitious goals is one thing. Chasing a dream that will never materialize is something else. None of this means you should switch to “maintenance mode” and give up on setting challenging goals for yourself. Rather, it means accepting that certain things are out of reach, hitting the reset button on your goals, and coming up with an intelligent, realistic plan to reach those goals. Building muscle after 50 will require a plan that recognizes where you are now and not where you were 20 years ago. You may even be able to tweak what you’re doing at the moment. Sometimes a bit of experimentation with different exercises, sets, and reps is all that’s needed. Building muscle after 50 does’t necessarily mean that you need to ditch your entire program and start again with something else. What you do to one changes what happens to the others. Let’s say you turn everything up to the max, and train with high frequency, high volume, and heavy weights. On top of that, you take all your work sets to failure (or very close to it). Chances are you’re going to be left burned out and injured sooner or later. As far as frequency is concerned, I think you’re better off training each muscle more often, but inflicting less damage on your joints and muscles in each workout. In practical terms, this means working each muscle group 3-4 times a week, rather than once or twice. Your tendons and ligaments are not what they once were, and their capacity to recover declines with age. Injuries take longer to heal, which means you’re going to be out of action for longer if something does get injured. And it’s not just the time you’re out injured that you have to think about. It’s also going to take longer for you to bounce back and get back in shape. As boring as it sounds, injury prevention does take on a much higher priority as you get older. All of which means you need to be careful with your joints, and choose the exercises you do with care. I’m not telling you to stop doing this or avoid doing that, because I don’t know you. There’s no rigid and universally “correct” list of exercises that you should do for building muscle after 50. However, I am going to suggest being very cautious with some of the “higher risk” exercises, such as depth jumps, clapping push-ups, kipping pull-ups, and high-rep Olympic lifts. Unless they’re strictly necessary, leave them out. I also avoid dips and flyes, as well as behind-the-neck presses and pulldowns. Again, some folks can do them without a problem. But there are more “shoulder-friendly” options available that do the job just as well. Heavy compound lifts, such as the bench press, squat and overhead press, can also lead to joint pain. Although shifting to lighter weights and higher reps is often enough to solve the problem, it’s worth experimenting with different exercises to see how you respond. In fact, the training variables I mentioned earlier will be affected by the exercises you do. Certain movements take less of a toll on your joints, meaning you can ramp up the frequency and effort. At the moment, I’m using a modified version of my MX4 program, where I go to the gym five days a week and hit each muscle directly at least three times a week (I plan on releasing an update to the program with this new 5-day version included, so stay tuned). If I was doing a lot of heavy barbell work, that type of approach would make my joints flare up. But because I’m doing more machine work and isolation exercises, it’s not a problem. Weight machines come in for a lot of flak these days. But they’ve saved me from “injury hell” on more than one occasion, and may well do the same for you. Even Arnold wishes he had access to certain weight machines back in the day. “Squatting and all those kind of like heavy leg exercises, I can’t do anymore. My knees are shot. I have to protect my knees because I want to go skiing. “The machines that you have today, I wish that I could have used them in addition to what I did, because they’re really amazing. A guy like myself who had shoulder surgery, hip surgery, knee surgery — they can always find an exercise around the injury that I could do. “If you love certain machines and they feel right, do them,” adds veteran strength coach Bret Contreras, who himself has made the trip around the sun more than 40 times. Some of the exercises I’ve used to work around various joint issues include single-arm cable pulldowns and rows with rotating handles, neutral grip dumbbell pressing, push-ups from different angles, and so on. Because these exercises don’t “do in” my joints, they let me carry on stimulating my muscles with less risk of injury throwing a spanner in the works. You could also switch gears from trying to lift more weight to increasing your repetition strength (i.e. doing more reps with a certain weight). Constantly pushing yourself to lift heavier weights is one way to make your muscles bigger, but it isn’t the only option on the table. In fact, a focus on driving up your repetition strength can be a whole new challenge for your mind as well as your body. I was on the leg press the other day with some occlusion straps on, working in the 20-25 rep range. Towards the end of each set, my quads were on fire, but I knew there were still another 6 or 7 reps to go. That’s hard work mentally as well as physically. Thoughts of throwing in the towel entered my mind. But I decided to ignore them, grit my teeth and keep going. It’s good “mental toughness” training as much as anything else. Can You Regain Lost Muscle Mass? Yes, you can regain lost muscle mass. In fact, regaining lost muscle mass is usually faster than gaining it in the first place. That’s because of a phenomenon known as muscle memory. When a muscle is gained, lost and then gained back again, studies show that grows more quickly during the rebuilding phase . Muscle tissue itself can’t actually “remember” anything. Rather, the number of nuclei in muscle cells increases when you lift weights. “When you start training, your muscle cells get bigger and develop more nuclei,” explains Sweat Science author Alex Hutchinson. All other things being equal, if you’ve been in shape before, your muscles will grow a lot faster than someone who’s starting from scratch. Changing your mindset can be hard to do if you love lifting heavy, and not everyone can make the switch. But unless you want to be one those “older guys” in the gym who is constantly in pain, because you’re still trying to do the same stuff you were doing 20 years ago, it’s a switch you’ll need to make sooner or later. Bruce Lee once said that the stiffest tree is most easily cracked, while the bamboo or willow survives by bending with the wind. And that’s exactly what you want to do as well. Your body can’t recover from and adapt to the kind of punishment you used to dish out in your twenties. But, if you’re willing to “bend with the wind” and change your approach, it doesn’t matter. With the right type of training, you can still build muscle and get strong well into your 40’s, 50’s, and beyond.